This might be picking a nit. However, strictly speaking, phenomenology explicitly tries to reject the Kantian distinction between noumenon or the thing-in-itself and the phenomenon. At the same time, however, the whole system of phenomenology remains profoundly influenced by Kant and Hegel. There's some variety of schools of phenomenology, but all of them are based on the phenomenological reduction which says, not that the world as it exists in-itself is unknowable; but (perhaps more radically) that it is not the business of philosophers to inquire whether the world exists at all, but only to confine themselves to the study of phenomena. On this view, one only begins to philosophize insofar as one reflects upon the naive assumption that the world exists and strives to come to a species of knowledge that is independent of that assumption. Phenomenology claims to be compatible with the assertion that reality is knowable in itself and thus to overcome the intractable problems of idealist metaphysics. However, from the standpoint of classical realism, the phenomenological reduction is clearly a fallacy of the excluded middle. As to the existence of the world, one has three choices: to affirm, deny, or doubt. Phenomenology chooses "none of the above," but in practice it reverts either to denial (i.e., existentialism) or Cartesian doubt. Dietrich von Hildebrand is an example of a phenomenologist who was also a realist and anti-modernist. But he is the only example that I know of. I believe that Heidegger very much wanted to bring his particular take on phenomenology into alignment with Aristotelian-Thomism. I also believe the attempt would be successful, but it still awaits a philosopher talented and diligent enough to pull it off. St. Teresa Benedicta of the Cross, early Sheler, and early Husserl were very much realists. While not all of the Göttingen school became Catholic, many were. Von Hildebrand is part of a much larger tradition of anti-Idealism. St. Teresa's final work, Finite and Eternal Being, is masterful. Thank you once again for a great article. Your diligent work to expose Guardini and other vermin like him is truly appreciated. Also, I find it interesting that phenomenology appears a lot like Common Core. Lol! Never thought about it like that! When & what group pushed the idea this priest was 'catholic'? Guardini writes well, and wrote several devotional books, such as "The Art of Praying." He had Modernist defenders in the hierarchy who saw his ability to gently lead people astray. He'll give you something 99.9% pure if he can get you to ingest the 0.1% poison. "It is reported that the great Thomist wrote on Wotyla's dissertation, 'Writes much. Says little.'" That was a pretty concise and accurate assessment of Wotyla by Fr. Lagrange. However, if he wanted to be even more concise and more accurate, he should have just wrote, "Barking heretic!" Or if he were perhaps a little less concise and a little more prophetic, he might have written, "This is the product of a diseased mind. He should make a fine anti-pope some day." I myself would probably have written, "I read the first paragraph. They don't pay me enough to read any further. Grade:'F'"
I must admit George, I like your comment better than Fr. Garrigou-Lagrange !! 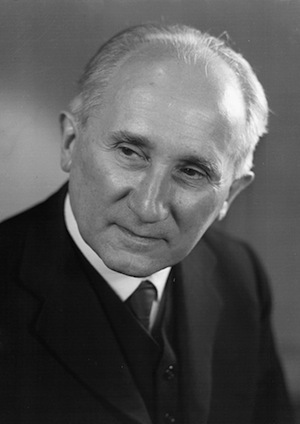 One of the things I dislike about Romano Guardini is his obscurantist literary style. As an example of such, I could compose the following throwaway sentences based on something Guardini actually wrote which I am dimly citing from memory. "'If our hearts should condemn us, God is greater than our hearts, and knowest all things' These words of St. John reveal to us the depth and mystery of God's merciful reign over the heart. He does not say that we are excused. He does not say that God has purified our hearts. But God is greater than our hearts, and 'knowest all things.'" Such constructions appear so often in Guardini's writings that they can be regarded as formulaic. The formula has three essential features. 2. Dismiss a few plausible interpretations of it. 3. Repeat the quote as if the words have suddenly acquired a deep new meaning in the interim. Guardini is not the only one to employ such formulae. Ratzinger's book, Jesus of Nazareth, contains similar constructions on almost every page. For my part, I'm not sure what such "explanations" as these are supposed to explain, but I can easily see how supposedly scholarly men are allowed to get away with this sophistry. It caters to the intellectual vanity of their audience members who pretend to "get it." It's just like those who gravely nod along when listening to the inane poetry of Maya Angelou, or who solemnly regard a Picasso as if his nonsensical cubist deconstructions plumbed heretofore unknown psychological depths. When I was still a fresh-faced and recently converted Novus Ordite, I eagerly bought and read Ratizinger's Jesus of Nazareth, which was released the very same year I was NO-confirmed. As desirous as I was at that time to see everything even nominally Catholic in a positive light, and as touted as the scholarly reputation of Ratzinger was in NO circles, I still found slogging through page after page of this stuff to be rather tiresome. I remember thinking at the time that it sounded like nothing but a half-backed effort to imitate the Protestant theologians I had read, like Tillich and Chardin. Needless to say, I am a Traditionalist today. I'm very happy you found your way into the One True Church, and I appreciate your thoughtful comments. What you say about Guardini and his Modernist ilk is true. I'm reminded about the adulation given to Wotyla's "Theology of the Body." The words of Fr. Garrigou -Lagrange once again come to mind: "Writes much. Says little." Your summary is absolutely perfect! !